Though I am now hospitilized, I remembered that I had a memory stick with some basic D&D stuff on it. Whatever...to refuse to succumb to the drearyness of lying down, and continue to fight my depression they allowed me to work on my maps. As I do'n have access to most sources, I had to create something anew or improve something done earlier. i'm under supervision, but i might be released soon. so...indeed i'll be back. i am allowed internet only shortly, but the olde pc there enables my memory stick to get me able to work on things i've don not a long time. Anybody a response/reflection on the Arch of Fire map? Robin wrote: i'm under supervision, but i might be released soon. so...indeed i'll be back. good to hear Robin. We'll have a virtual party in the Glantrian thread to celebrate when you get out. As far as the Arch of Fire itself, technically flawless to this idiot's eyes. However I am drawn/distracted/interested by the lack of overall heights in altitudes around the arch of fire. Perhaps it is just the Glantrian alpine snob coming out in me... but 5000 odd feet....those are hills not mountains You ain't a mountain until you hit perhaps 4 to 5 thousand feet rise .. over 'level terrain. I'm seeing at most a couple thousand feet. This map is finished, checked, updated and checked again. This unfinished map (finished 60% orso) of the Silver Sierras and Redstone Glantri is still being worked on together with our famous Micky of Glantri. We released it though more information may alter the map greatly on location. Apparently this tricky mage has buried himself in family troubles of the Ambreville family again...or delved a bit too deep in Glantrian military- or Great School of Magic- secrets and proceedings, or he is on the run for some Redhead,...eitherway he might be in hiding...I am certain he'll pop up again soon, singed, electrified or smoking, but smiling with more new information. If you have additional information belonging to this region, just inform me. Btw for those who do like large maps, I have made these maps in such a way they do overlap to form a huge gigantic (Gargantuan??) map if printed out. Simply AMAZING work, Robin. Just downright AMAZING. Great maps indeed and very useful! Sturm wrote: Great maps indeed and very useful! Irondrake wrote: Simply AMAZING work, Robin. Just downright AMAZING. Please check and inform me of any flaws, even if minor ...Then I can repair that. As most of these maps still need work on it to be done, you will surely find flaws in those. So...Now I have almost reached the end of my secret Project, I can continue my work on the 1 mile maps. I decided to continue with the Broken Lands West and the Ethengar Khanates. For Ethengar...I have made some research and translations. This I did on a readjusted replica of Thorfinn Tait's Replica of the Gazetteer 10 map of the Ethengar Khanates. This map is thus used as a research tool for my upcoming 1 mile maps of the same region. I have named all the Hakomon Sites named by me after Ethengerian (Mongolian) names/translations. and Area names are translated to Ethengerian (Mongolian). I releas this here early, as the naming, could well be used by DM and players already traversing in , from, or to the region. Hope you like it....I did at least, and it inspires me for the mapping. I will return soon, with some discussions, as there are some flaws, mistakes, and contradictions on the mapping matter here. I hope to get these clarified then. PS Sturm, you have created several very very interesting locations in Ethengar 2300BC, and such (for threshold for example). Could you give me a list with names, what the locations actually are(ruin, magic spot, settlement, etc), and where to find them on the map, and if they would have a chance to remain existing in 1000AC+ (be it intact, used otherwise, or as ruin). I intend to use them as detailing in the 1 mile hex mp, so you understand my request to be as detailed as possible. Last edited by Robin on Fri Sep 14, 2018 5:55 pm, edited 1 time in total. Hi, 2300 BC is the setting devised by Chimpman, maybe it was his map you are referring to? I may have something too in Threshold article but I will have to check the issues tomorrow..
Ah...ok...thanx....Then the question is also for our Chimpman. I remember proofreading an adventure in or near the Blacksands, yet can't remember who made it, and even if I find it, i won't know its state in 1000AC Ethengar. So I need the input of the creator of those sources to reflect this. Could you all (and I mean ANYONE reading this) having any information on Ethengar beyond the gazetteer, which could be useful on a map; give me with these names/locations, what these locations actually are(ruin, magic spot, settlement, etc), and where to find them on the map, and if they would have a chance to remain existing in 1000AC+ (be it intact, used otherwise, or as ruin). As I intend to use them in the 1 mile hex map, so you understand my request to be as detailed as possible. Would you not agree with me this article, almost completely describes the World Mountain? It explains the ashes (natron crystals), the blacksands (turning white in time, the constant activity, the mudd pools as per gaz 10, the only thing not included would be a perpetual shroud...as many think the mountain has....however, nowhere in gaz 3 (and I stand corrected if I am wrong) it is described the mountain is in a state of perpetual darkness (or shroud). Any darkness I found is easily described as being evening or night, or coverage by heavy clouds (ash clouds??). As being the only single mountain on a plateaus which also suffers gigantic depressions, a volcano like this would explain all. It also would explain the energy source of the Planar portals, the interest the Blacmoorians would have had (high mineral/energy source), it would explain the dwarven interest later, and could well explain the almost circular spreading of magical Hakomon locations...(as if they were ejected and came to be on impact). Keep in mind this whole region is nearby volcanic active (the whole Broken lands, the volcanoes in the Collssus mountains, Glantri and in the north of Ethengar...the location would thus be exccellently explainable. I begin diving in the Information. I will try to create a history line based on all the geomorphological, biological and cultural effect. A lot of settlement are found already; especially the Karghthyne and Demehvand have left behind traces...I wonder if these would be ruins, totally gone, or absorbed into newer structures. I do not believe any of these would be lost(not discovered) as the region is heavily traversed/scouted/and thus at least basically known. The 1700 BC map does not have the lake included. Yet a lake of this size does not dissapear suddenly and reappear later. The Geomorphological History of the Broken Lands created by me explains this in detail. Yet this year would be the beginning of the decline of the lake and its functionality to the locals (as it is greatly affected by dust/toxins in the ages following). I tend to ignore the many white spots on the 1500 BC map, as they are not equal to the before and afer maps, without a logical reason. There is snow/ice dissapearing, so I assume this is an artist flaw of the time in between. I also have to infuse all information from before GRoF...at least some would have left traces of some kind, and at least some ruins would exist. Ok I am going to show you the work in progress. WORK IN PROGRESS!!!UNFINISHED!! ANY INPUT WELCOME and even requested...please!! This 1 mile hex map is under construction, Yet As I enjoy input from other gamers, I place it here so it can be reviewed. 1 The detail map of the Court of the Golden Kahn in Chagon-nah, and the 8 mile hex map, show a very different area although these should be similar. As the detail map is 1 inch=500 feet, and 5280=1 mile, (1 inch on the map is equal to the length of the bidge to the storage island and southern coast) there is a clear discrepancy to be seen. I am unsure how to resolve this. 2 As the area is a plateaux tilted towards the southwest and is very low in flow angle of the rivers, I decided to place these in a so-called erosion bed, where the rivers continuously flollow their curving and changing path without really altering the environment. to enable this the rivers must be somewhat lower than the river sides, and in a sand bed. This sand can thus erode with the flow, following the river, and be deposited in Chagon-nah, along the way or in the depression (former Anur Lake) near the Broken Lands. New sand, or dust(from world mountain) can originate from dust of the plateaux blowing Northwest (canon according Trail Map1) blowing south easteast, captured there by the hills and thus creating a steady flow. the sand ash mixture also tends to cling together hindering erosion and fluvial displacement greatly. all together, this should keep the rivers as they are for a much longer period than normal. This I have displayed in the map. 3 World Mountain. Gazeteer Ethengar does state various proofs this is and was a volcano. however this can only be a volcano similar to the African Ol Doinyo Lengai Volcanoe...a so-called cold volcano, producing crystaline ash instead lava. In retrospect I assume the Writer of Gaz Ethengar, probably had the african World Mountain Vocano in mind when creating the Ethengar world Mountain. the names being equal is not a coincidence I presume.More on this later. This also explains the large depressions in the plateaux as on the 8 mile hex maps. (Sea of Flowers and Chagon-Nah)...see the map of Ol Doinyo Lengai, which has these same effects. 4 Also very important is the eastern source of the Krandai River; being volcanic hot geysers, these also bring new sediments. The Krandai river is thus high in nutrients and seeping water in the areas next to the river will have a higher production rate; ie more plants, diversity and size. I already had created this region here; https://www.deviantart.com/6inchnails/a ... -645977491. This seems to mostly fit all canon (and most fanon information, although some details have to be added. Any input is welcome !!! According the history maps of our Chimpman and Sturm. Some trees groups and other details will follow. I adjusted the Ethengar Timeline with adding the geological and spiritual activities to it. I hope you like the Spirit/Geological activity attachments to the sociopolitical happenings. There are as far as I could find (and I delved through all the Gazetteers, Trailmaps and the Almanacs ) no canon sources for the height of the volcano. As I asume it mimicks Real world Ol Doinyo as explained earlier, I will follow those statistics. making World Mountain 10.459 ft (3188 m )	as the platau of Ethengar is set canonnically at an average of 3800feet (3800 NW, 4000E, 385SW, 3900SE, 4400N+NE, between 3300 and 400 W, between 3800 and 400 S), the mountains thrusts an average of 6500 feet above the grasslands...a real domineering sight. Although I have to wait for additional input and the historic details of Chimpman, I succeeded to make a geological sane base. when these are available, I'll add these to the map(s). Whereas most lavas are rich in silicate minerals, the lava of World Mountain is a carbonatite. It is rich in the rare sodium and potassium carbonates, nyerereite and gregoryite. Due to this unusual composition, the lava erupts at relatively low temperatures of approximately 510°C (950 °F). This temperature is so low that the molten lava appears black in sunlight, rather than having the red glow common to most lavas. It is also much more fluid than silicate lavas, often less viscous than water. The sodium and potassium carbonate minerals of the lavas erupted at the World Mountain are unstable at the Mystara's surface and susceptible to rapid weathering, quickly turning from black to light grey grey in colour. The resulting volcanic landscape is different from any other in the world. The carbonatite ash spread over the surrounding grasslands leads to a uniquely succulent, enriched pasture. This makes the area a vital stage on the local grazers, enabling rich grounds to become the nursery for the birth of several thousand young each year. Settlers from Blackmoor create the New Blackmoor Colonies. The dormant or assumed dead volcanic Mountain in the fields of Ethesh is proven to be rich in minerals and a mineral mining and plant and nearby city Grassdale are created. Transport is done manually, by horse first, and later by various metal cars, and vessels along the rivers, and also by the Radiance lines. The volcano resembles more a single huge hill than a mountain. the top is at 3500 Feet, while the graaslands are at an average of 1400 feet. Lake anur is at 800 feet. There are secret magical planar researches conducted on the mountain and on several locations in the land of Ethesh. GRoF obliterates Blackmoor; the Planet shifts, Ash and Dust causes the land to be covered by ice and snow.. Ice recedes from the Steppes. Spirits are drawn in to merge with the world. Moadreg Dwarves locate the city and mining ruins of Grassdale on the small mountain. They do not know it is a 'dead' inactive volcano. like the former Bkackmoorians the delve for Carbonatite and other Minerals. Their use of Radiance magic is great and soon affects most of the local sources of magig. There are even Interplanar disruptions due Dreamwalking and Shadowmancy each connecting to the nearby Sphere of Entropy and the Spirit Realm. the Dwarves have left the Plains. Leaving behind their mostly still active technomantic sources. Ethengars arrive on the fertile lands of the steppes. Elves from Glantri trigger a cataclysm that has a profound effect on the land of the steppes. the land of the black sand and the broken lands are formed. World Mountain has reawakened in a massive eruption. 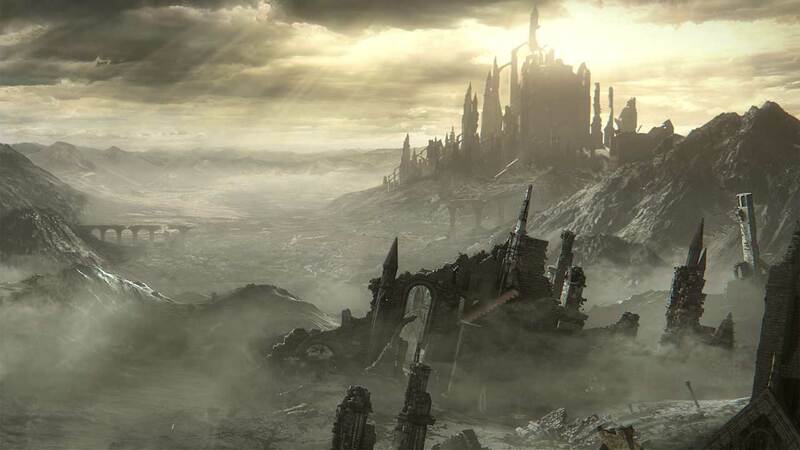 The Ruins of the former Blackmoor city and mine/plant are devasted, this picture reveals these ruins as in 1000AC. Geomages assume the massive cataclysm which shaped the Broken Lands must have triggered a higher activity in the volcanoes of Brun. In the south massive landmasses are submerged, the Broken Lands are created, many volcanoes become active, amongst the World Mountain. The Plateaux of Ethengar is lifted and tilted more, causing Lake Anur to increase significantly over time and the shallow depressions in Ethengar to deepen. The southwest becomes the lowest while the northeastern becomes higher. Geysers in Vestland reveal volcanic activity; see here Unknown to the Locals the Spirit Realm (Limbo??) and the Sphere of Entropy have contacted the Prime Plane and several gates between the Prime Plane and these interplanar forces/planes have opened. 1691BC til 1660BC The Chaotic Blue Dragon named Tsenker Luu (Blue Dragon in Ethengerian=Mongolian) by the Ethengars ascended to Immortality. As Dragon 170 explains; When a small chaotic dragon becomes a large dragon, a violent storm hits the region, causing great fear and some damage.When a large chaotic dragon becomes huge, a devastating earthquake rocks the region, possibly causing volcanoes to surge from the earth and erupt. Upon the ascension to Immortality of a chaotic dragon, all of these signs occur. A wave of terror and destruction is inflicted upon the region as well by all the chaotic dragons that are now free from their magical bonds and eager to celebrate the event-or go to war against each other. World Mountain did erupt for about 30 years, and expanded greatly. The storms raged over the land and there was no Ethengar not afraid of Blue Dragons. Great combat and destruction caused the Ethengar's initial growth to slow down for a period of about 30 years. This time was known as the War of Succession. And then they had to rebuild. It may have been this period which instigated the ethengars to become a truly nomadic people, as what you take with you can't be burned or destroyed, and can more easily be repaired or exchanged, than common buildings. This Ascencion of the Dragon Tsenker Luu created the Hakomon location later known as Hooplak'hai south of Chagon'nah. Many Hakomon notice an increase in the amount of wandering Spirits, especially evil spirits. Ethengar Raiders attack the Flaemish in Glantri; the Kahn's horsemen are driven out. A major eruption in Klarmont 917 AC deposited volcanic ash up to 148 miles away. carbonatite ash spread within the boundaries of World Mountain. A Great Kahn attempts a major invasion of Glantri but is defeated at Skullhorn Pass.Glantrian mages notice several ghostlike subjects accompanying the invasion, and wraithlike entities directly after the battle, yet these dissapear when the Glantrian magical forces proved too strong. An eruption at the volcano of Skullhorn pass and on World Mountain took place for several months in 926 AC. On World mountain carbonatite ash spread widely on the North Side of World Mountain. On Skullhornpass a constant lava stream is created which did not stop until today.The lava slowly erupts, and returns to the domains below through holes in the bottom of the formed lava lake. A Spirit Lord besieges a Hakomon to subdue Toktai Kahn. Evil spirits seem to accompany him. Toktai Khan then besiegs the Heldann village Hayavik and is killed in the final battle. Hayavik is destroyed. the Horde withdraws to select a new leader. Another war of succession begins. Irregular eruptions of carbonatite ash spread within the boundaries of World Mountain, also by side vents. Moglai unites the clans of the Murkit tribe.Toktai Kahn is now an evil spirit; a Hakomon by the name of Maglai says so. An eruption between Felmont and Kaldmont 926 AC deposited ash 100 miles away. High amount of carbonatite ash spread within the boundaries of World Mountain, also by side vents. The united Murkits defeat the warring clans of the Maghurs. All Maghurs males are put to the sword. The area is visited by undead spirits soon thereafter. Several minor eruptions of glowing lava were observed in 985 AC. Several Hakomon of various tribes battle. Animal and Undead spirits join the fight. Moglai Kahn turns his attention to the Hajiks. he defeats them and wipes them from the face of the earth.Three Odic are noticed at the end of the battle. Several Carbonatite ash spread within the boundaries of World Mountain, also by side vents. Three Hakomon agree together with several Nature spirits that unity is better than diversity. This concept is spread amongst the Ethengar tribes. Other clans unite into tribes for protection. The tribes turn to fighting each other. Some intense and several minor carbonatite ash eruptions spread within the boundaries of World Mountain, mostly by by side vents. Moglai Kahn aids the Bortaks against the Kiyats. in return the Bortaks accept Moglai Khan as their rightful ruler. Surviving Kiyats swear allegiance to Moglai Kahn. Several Spirits ascend and descend World Mountain. Severe amounts of carbonatite ash spread within the boundaries of World Mountain, also by side vents.Several Geysers erupt from the region.Evil Spirits are noticed near the Natron Lakes. Uighurs seek Moglai Khan's aid against settlers from the Heldann Freeholds. the Settlers are slaughtered. Hakomon know evil spirits were amongst both sides of the battle unknown by the combattants. High amounts of carbonatite ash spread within the boundaries of World Mountain, also by side vents. Taijits attack Yakkas but are defeated. Moglai agrees to aid the Taijits in return for them to become vassals. Fearing defeat, the Yakkas also join Moglai. The Hakomons succeed in contacting several Spirit lords, and spread their influence. Minor eruptions of lava (!!) were observed in the early months of 996 AC. Carbonatite ash spread within the boundaries of World Mountain, also by side vents. The other tribes rapidly follow and Moglai declared Kahn of Kahns on 14 Fyrmont. The Keshak is formed. All spirits seem to have come to a balanced status-quo. There is opposition, but the power shifts are minor from here on. A major eruption occurred. Geomages Dawson and Clark secretly visited the crater a week later and reported seeing "a thick column of black ash" that rose for approximately 3000 ft above the volcano and drifted away northwards. When they climbed the cone-shaped vent, they reported seeing a continuous discharge of gas and whitish-grey ash and dust from the centre of the pit. High amount of carbonatite ash spread within the boundaries of World Mountain, also be most sidevents. A meteor slams into the Silver Sierras in North Darokin/West Broken Lands/South Glantri. New Volcanic activity in the world mountain caused daily earth tremors in Ethengar and even north of Rockhome from 12 Fyrmont 1006 AC until 18 Ambyrmont. Many evil spirits are sighted by Hakomon. Several adventurers on the borders of Ethengar are even attacked by various sprits. The Great Kahn of Ethengar, whose people have suffered from savage raids by the Heldannic Knights and have been pushed eastward by the chocking black clouds from the meteor in the wat, invades the Heldann Territories. His forces march straight to the capital and lay siege to it in the morning of 5 Kaldmont. 5 Kaldmont 1006 AC at 8.30pm. The strongest tremor measured 6.0 on the Quake scale. Geomages suspected that the sudden increase of tremors was indicative of the movement of magma through the World Mountain. The volcano erupted on 4 Ambyrmont 1007 AC, sending a plume of ash and steam at least 180 miles downwind and covering the north and west flanks up to 100 miles in fresh carbonatite flows. Spring. In the Heldann Territories, the city of Freiburg is still under siege. the armies of the Golden Kahn continue to pour into Heldann Territories, and spill across the borders into Vestland and Ostland, looking for more places to sack. many spirits, including evil spirits are sighted and undead spirits combatted on the sites of battle before, during and after. Hakomons visit the Gates on World Mountain and notice an increased activity in the Spirit Realm. The 1006 AC eruption continued intermittently into 1007 AC. At the end of Vatermont it was reported to be gathering strength, with a major outburst taking place on 5 Thaumont. Periods of inactivity were followed by eruptions on 8 and 17 Flaurmont. Eruptive activity continued until late Fyrmont 1008 AC. The Hakomon visit to the summit in Ambyrmont 1007 AC discovered that carbonatite emission had resumed from two vents in the floor of the new crater. Later Hakomon visits to the crater in Thaumont/ Flaurmont 1009 AC showed that this activity appeared to have ceased. Winter 1007-1008AC In the Heldann Territories, the besieged city of Freiburg is ravaged by a sudden and swift-spreading plague. the Kahn immediately mobilizes all his forces and rtreats into thengar, but he's too late; once there, plague breaks out among his own troops and spread amongst his population. The amount of spirits seen, or assumed is greater then ever before according Hakomon. up to 20% of the population perishes of Heldann and even more in Ethengar.The Great Kahn and his armies are disgraced by the failure of the invasion of Heldann Territory and the Northern Reaches and by his inability to stop the counter invasions. a challenger to his rule would be welcome by many discontent warriors, but so far none has stepped forward. In Kalmont 1007 AC, two separate carbonatite flows and a small lava lake were captured with a "Capture the Moment" scroll by our well known Glantrian mage Micky in an overflight(see here). This volcanic activity continues until fall 1009AC, coinciding with the week of no magic. The Great Kahn attacked the Heldann Territorries hoping for a quick victory while the Heldannic forces were occupied with conquering Landfall and other matters. Months of besieging Grauenberg, skirmishing with Heldannic troops, and raiding Heldannic settlements resulted in very little gain for Moglai Kahn. Changing tactics, he proposed peace with the Heldanners; Ethengar and the Heldannic Territories are now uneasy allies. The volcano resumed natrocarbonatite lava flow which started to fill the large crater from the 1007-1008 eruption. As of Felmont 1012 AC, There is a large active hornito on the western edge of the crater floor. During Klarmont 1012 AC, Ethengerians near the volcano reported several earthquakes. The new crater is near to inaccessible and Hakomon climbers have only occasionally glimpsed into it. The great gate to the Spirit Realm can no longer be accessed by the Hakomon. The amount of spirits in Ethengar has significantly dropped. 29-09-2018 Adjusted slightly by adding Chimpman's 2300BC information in it. Last edited by Robin on Sat Sep 29, 2018 1:29 pm, edited 5 times in total. Then I don't understand why so few comments??? On the Otherhand...my work continues...one way or another . What to do next; Altitudes lines, Sliktor Orc caves(where Gaz 12 just says north of World Mountain; is this within the Black Sands or just outside. the map seems to point their territory is just outside- what are these caves---grass ruptures due quakes? or chemical disintegration/fusion of matter due the volcano, or former ash, solidified, and eroded by water underground--this version belongs within the Black Sands of course), Natron lakes/creeks, normal creeks, names (unknown as of yet to most), details from Box of Rain adventure Gaz 12 Golden Kahn of Ethengar (within Black Sands but not far within--aka a few miles?? ), Burial places former Kahns(what type? Caves, Podia, Pits, Cairns, ditches, tombs? have to check what Mongols did with their unimportant dead and important dead...that might be a good source) , Known Hakomon sites and details from fanon(what the heck are these locations?.--some seem to be old fanon created old blackmoor ruis or something else, while other sources seem to play more on the biological aspect instead the sociological), Legend, combined description Black Sand Effects as per various noted sections in Gaz12. And of course the details from Chimpman and Sturm History creations when I have these all. 1 mile hex maps are great, when you are doing an adventure/campaign in the area. However the chances someone here is doing one right now, or examining the same topic right now, are slim. This is why you, and many other interesting topics on the forum, may get few comments but eventually a lot of visualizations. In the long run, it is an amazing work you are doing! Sometimes I feel as nobody reacts, or even has suggestions, comments, compliments or seeing flaws...any....probably that is this era. people are becoming less communicative...pity. Formerly I had the talkative Micky, Julius Cleaver, and others helping with ideas and thus the development, nowadays I have to seek it out all by myself...and that's hard sometimes especially in a hard life. this one I add to the list on which I am working. This is Southwest Ethengar, pressed against the Broken Lands. I have to add the information from Micky on the Glantrian province in the west, and Rockhome on the south. I am also compiling the information together about the Hakomon sites, so if any ideas, knowledge of please, please share. 2300BC there is also a Pillar named Hrokyrdran(same pillar as used in Sturm's Radiance Line transportation system of the new Blackmoor Colony of 3050BC) on the location of the8 mile hex depicting the future top of World Mountain. Would you see these ruins as all the same or just near to eachother; if so I can split them up due my 1 mile hex scaling? In my opinion the pillar would be indeed the same as the Radiance Line, yet as such a transport device would rarely be placed several miles outside the City, I assume the pillar and the city have the same location. The river I kept yet it has become a seasonal river --existing only in the spring and fall season for a few weeks-- being mostly dry/muddy beyond these periods. The river seems to have an access to the Fortress Kairhyeld, yet I do not know if this was intended as such. It could have been created on or at least with building materials from Sunland ruins. The City Sunland could in Blackmoor times have a mining facility for Carbonatite and other useful minerals which would also explain why it has become a city, even though thus far from all locations (it would be fully dependant on the rivers and the radiance Line). This same would apply to the Dwarves of Hrokyrdran, if I read Threshold right. So...Would you fuse all these ruins and river as being one or keep them seperate in a way or another. In a few days I'll post a list on all the Hakomon locations compiled thusfar in a seperate topic. I hope the get responses where information is lacking or flawed, to help creating a functional base for the further mapping.